From Justin Spittler: Oil stocks are ripping. 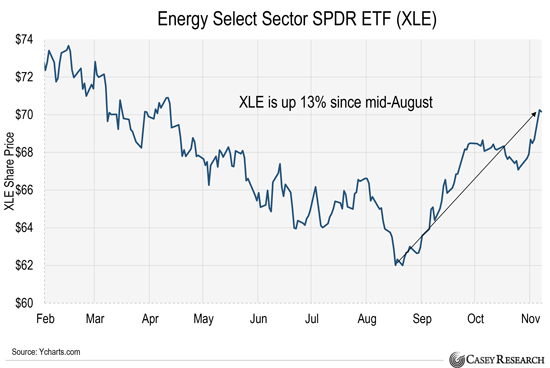 The Energy Select Sector SPDR ETF (XLE), which invests in 32 large U.S. oil and gas companies, is up 13% since mid-August. That’s double the S&P 500’s return over the same period. You can see this big move in the chart below. 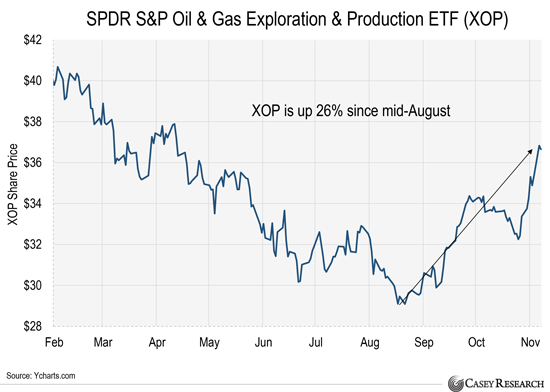 The SPDR S&P Oil & Gas Exploration & Production ETF (XOP) has done even better. XOP is another major energy fund. It invests in 64 oil and gas producers. Below, you can see that it’s up 26% since mid-August. That’s four times the S&P 500’s return over the same period. That’s because energy stocks have underperformed the market since 2008. You would have actually done much better blindly investing in an index fund. Because of this, most investors gave up on energy stocks. In fact, energy stocks make up just 5.9% of the S&P 500 today. That’s down from 42% in 2013. This is totally irrational. People are acting like the U.S. oil and gas industries are going out of business. But Dispatch readers know better. You see, the energy sector is highly cyclical. It goes through booms and busts. And after lagging the market for nearly a decade, the stage is now set for a monster rally in energy stocks. In June, I showed you how energy stocks were starting to bottom. Then in September, I showed you how XLE had just broken out of a downtrend. As I explained, this was the buy signal I’d been waiting for. Since then, XLE has jumped 3% while XOP is up 7%. These are decent gains. But they’re nothing compared to what we’re about to see. You see, energy stocks are in the early innings of a new bull market. And early investors stand to make a fortune. So today, I’ll tell you the best way to cash in on this bull market. And no, it’s not XLE or even XOP. The opportunity I’m talking about has far more upside than either of those funds. It’s up 25% since August. It’s now trading above $56 for the first time since June 2015. Demand for oil is rising. In September, the International Energy Agency (IEA) raised its global oil demand by 100,000 barrels per day (bpd). It was the third straight month that it raised its estimate. Global oil production is coming down. The Organization of the Petroleum Exporting Countries (OPEC), a cartel of 14 major oil-producing countries, has cut its production by 1.8 million bpd since the start of the year. This is all great news for companies that pump oil. That’s why XLE and XOP have taken off. These companies sell machinery and equipment to oil producers. They also provide services like seismic testing and rig transportation. You can think of them as the “picks and shovels” companies of the oil industry. But like oil producers, these companies are highly sensitive to the price of oil. Think about it. When the price of oil is low, producers make less money. That leads them to drill fewer holes…pump less oil…and buy less equipment and machinery. The price of oil plunged 75% between June 2014 and February 2016. This huge crash pummeled major oil producers. To survive the downturn, major oil companies cut their dividends. They laid off workers by the thousands. They also cut spending to the bone. In other words, pain spread to oil services companies. 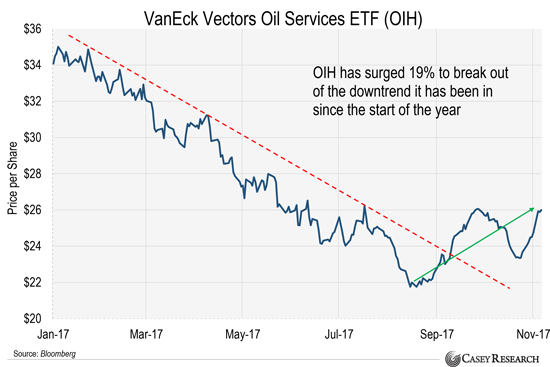 The VanEck Vectors Oil Services ETF (OIH), which invests in 26 oil services companies, fell 63% between July 2014 and January 2016. Many individual oil services companies fell more than 80%. But oil isn’t falling anymore. It’s surging. Last quarter, profits for ExxonMobil (XOM) and Chevron (CVX) jumped 50%. BP (BP) saw its third-quarter profits double. The same goes for Dutch Shell (RDSA). Then there’s Statoil (STO), another major oil producer. Its profits nearly quadrupled last quarter to $2.3 billion. This is incredibly bullish for oil services companies. It means producers will drill more holes, pump more oil, and buy more machinery and equipment. Just look at this chart of OIH. It’s up 19% since mid-August. That’s a solid move. 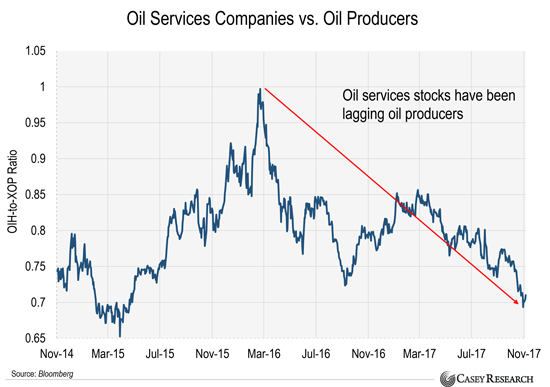 But oil services stocks still have a lot of catching up to do. You can see why below. This chart compares the performance of OIH with XOP. When the blue line is rising, it means OIH is doing better than XOP. When it’s falling, it means OIH is underperforming XOP. You can see that OIH has been lagging XOP since March 2016. This tells us oil services stocks are by far the most hated oil stocks out there. You can do this easily with OIH, which basically lets you bet on the entire industry. Just understand that oil services stocks are highly volatile. So, treat them like a speculation. This way you’ll be able to capture big profits without exposing yourself to heavy losses. The VanEck Vectors Oil Services ETF (OIH) was unchanged in premarket trading Monday. Year-to-date, OIH has declined -22.70%, versus a 16.53% rise in the benchmark S&P 500 index during the same period. OIH currently has an ETF Daily News SMART Grade of C (Neutral), and is ranked #26 of 35 ETFs in the Energy Equities ETFs category. This article is brought to you courtesy of Casey Research.